I rarely repeat recipes, and sometimes even shy away from ones that look similar to ones I’ve made before. It is all about variety! The more, the merrier! 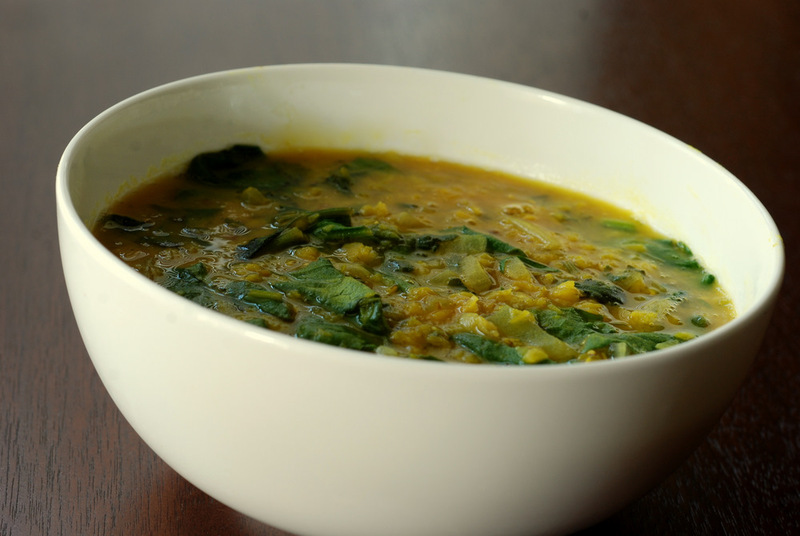 While I have made some really delicious red lentil soups, mostly with lemon (lemon+cumin+cilantro=fantastic), I was still intrigued by Deborah Madison’s Red Lentil Soup with Spinach and Lime from Vegetarian Cooking for Everyone. 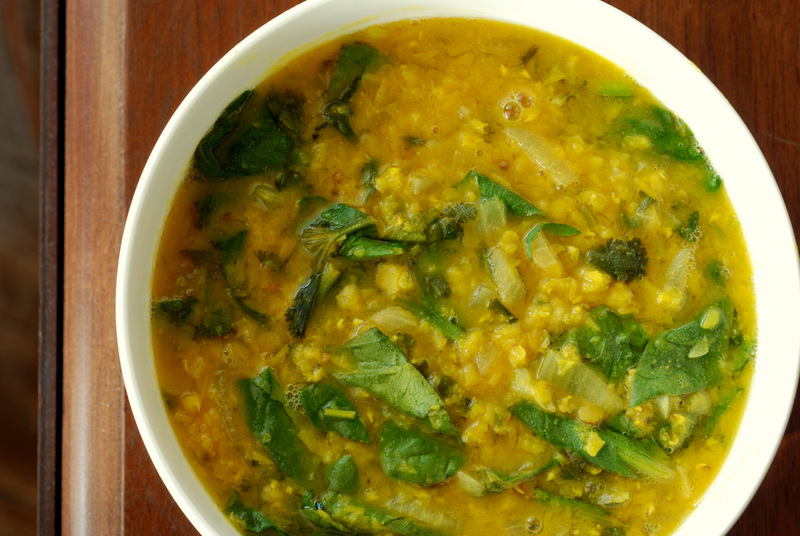 Both soups have similarities: red lentils, cumin, cilantro, onion and citrus. 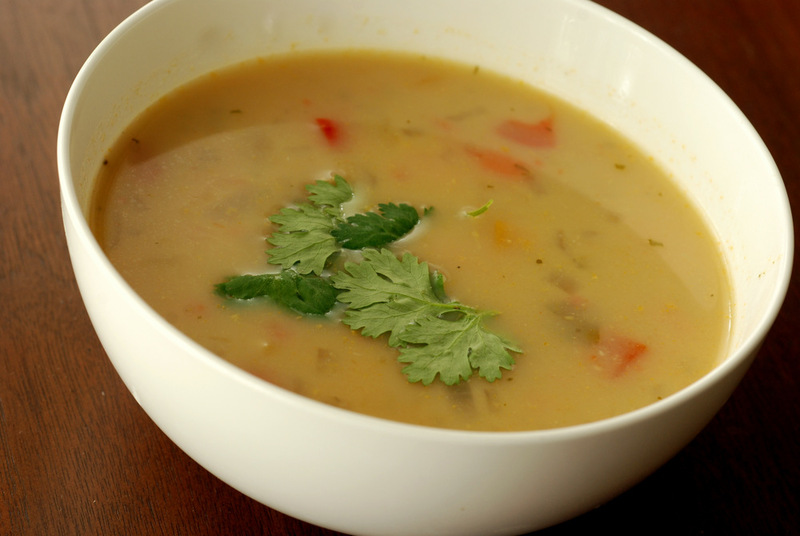 This soup just goes to show you how a simple change in seasoning can drastically alter a dish. Both equally delicious, yet completely different. 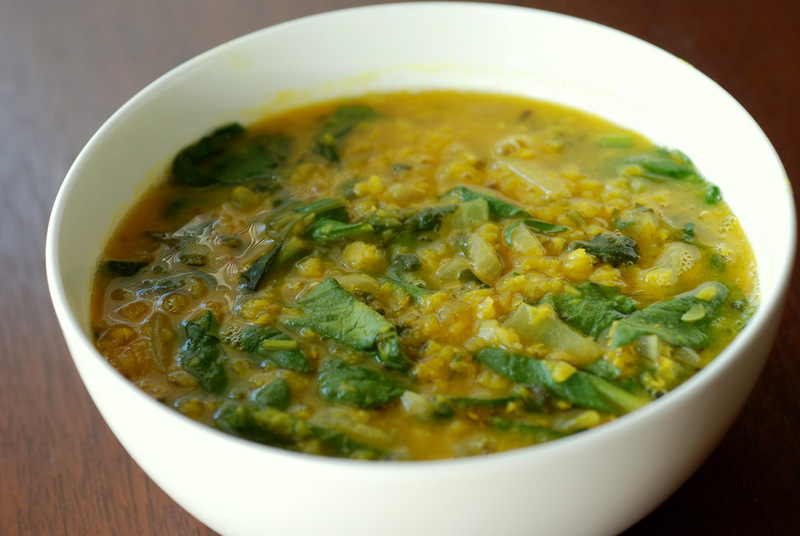 In this soup, you have a savoury red lentil soup flavoured primarily by mustard, oh yes mustard, with a hint cumin, sweetened by the spinach, then livened by the cilantro and fresh lime juice. They work so well together. And yes, this time my yellow mustard seeds did not disappoint! I am positively smitten by mustard. What are your favourite recipes with mustard? This is my submission to Deb for this week’s Souper Sundays, to this week’s Weekend Wellness, to this month‘s Simple and in Season and to Cookbooks Sundays. Bengali Five Spice, or panch phoran, is a super simple spice mix, though: equal amounts of cumin, fennel, nigella, fenugreek and mustard seeds. Presto, finito. As you can probably guess, it is a savoury mix of spices that create a complex depth of flavour. 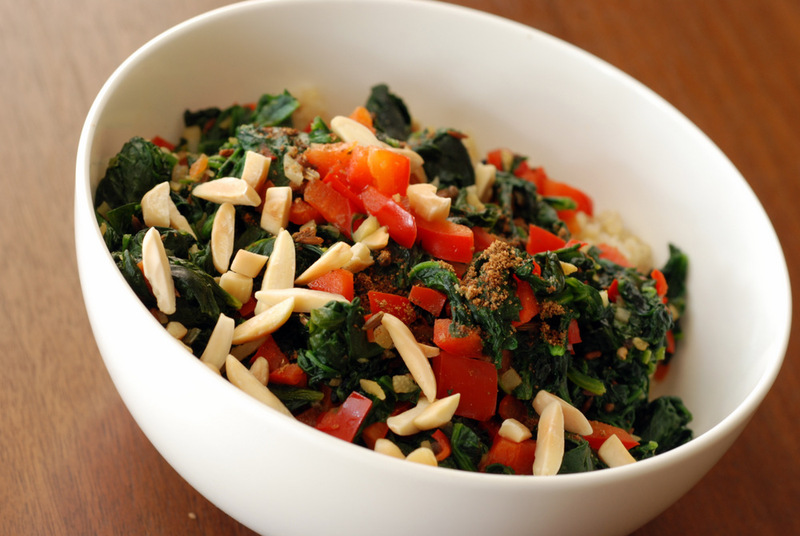 Here, it is paired with wilted sweet spinach, tender crisp red pepper along with some toasted almonds and garam masala. While I adore leafy greens, I am not a big fan of cooked greens as a side. But when I mix them with a grain or bean, then I’ve hit my mojo. For this meal, I opted to create a quinoa bowl to sop up the flavours and mellow the vegetal cooked greens. You might think this is just a side dish, with a lack of noticeable protein source. No bean, no tofu, no tempeh. 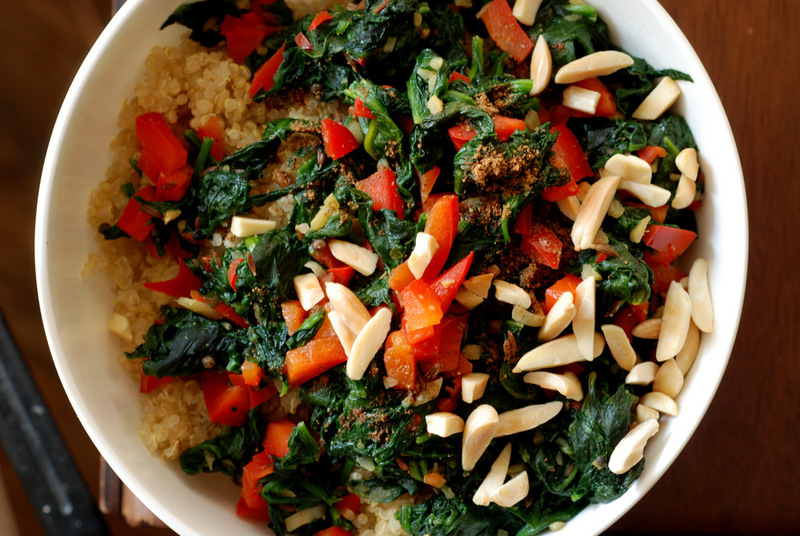 Quinoa itself contains a reasonable amount of protein but the protein superstar here is the spinach. Two bunches of spinach wilt down to maybe a cup or so, but it packs a serious punch of protein (almost 10g per serving- more than the 6g from quinoa!) along with an abundance of vitamins and nutrients (640% of your recommended vitamin A, 160% of your vitamin C, 35% of your calcium and 50% of your iron daily intake). All that in one serving! This is my submission to this month’s My Kitchen, My World for Bangladesh. The heart of Ethiopian cooking comes from berbere, its spicy blend of herbs and chiles, as well as niter kibbeh, their spiced butter/oil. Once you have those ingredients, you are off to the races for quick, tasty Ethiopian food. I made a huge batch of niter kibbeh with a tub of Earth Balance spiced with savoury spices like cinnamon, cardamom, coriander, garlic, and ginger. I used the recipe from Papa Tofu but there are many recipes online as well. In fact, when I first found the recipe for Warm Cabbage and Green Beans from the New York Times courtesy of Marcus Samuelsson, I quickly realized that the first part of the recipe was making the niter kibbeh. True to its Ethiopian roots, it uses an entire 1/2 lb of butter in the recipe but trust me, you don’t need all that fat. Trim that 1/2 cup to 1 tbsp, thank you very much. 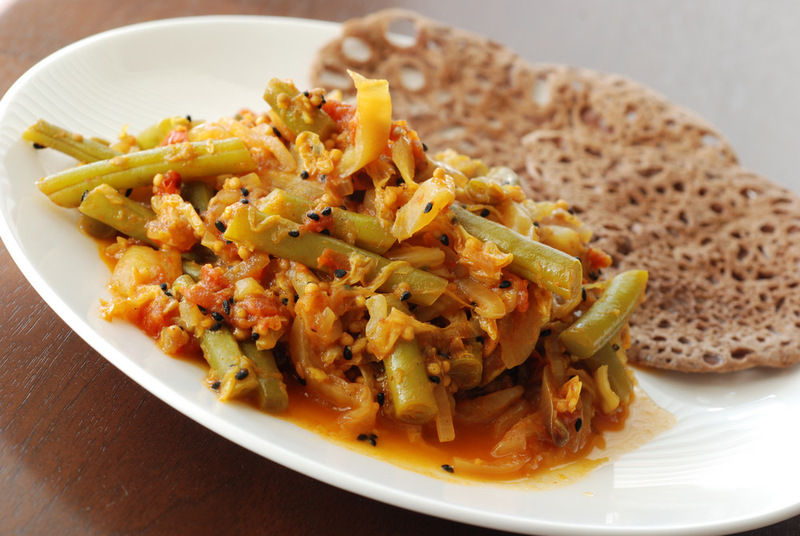 Instead of mild fassoulia, the ginger makes this a spicy and very flavourful cabbage and green beans side dish. This works really well with the mild split pea puree, for a contrast in flavour, texture and spiciness. Typically, Ethiopian food is a combination of a lot of little dishes served overtop a sour fermented teff pancake called injera. The sauces are absorbed by the pancake as you munch away. Then you scrape up the soggy, sour greatness. Sadly, if there is one thing I know I can’t duplicate at home, it would be making a super huge injera like I had in my last post. I don’t have any skillet that would fit such a huge pancake! 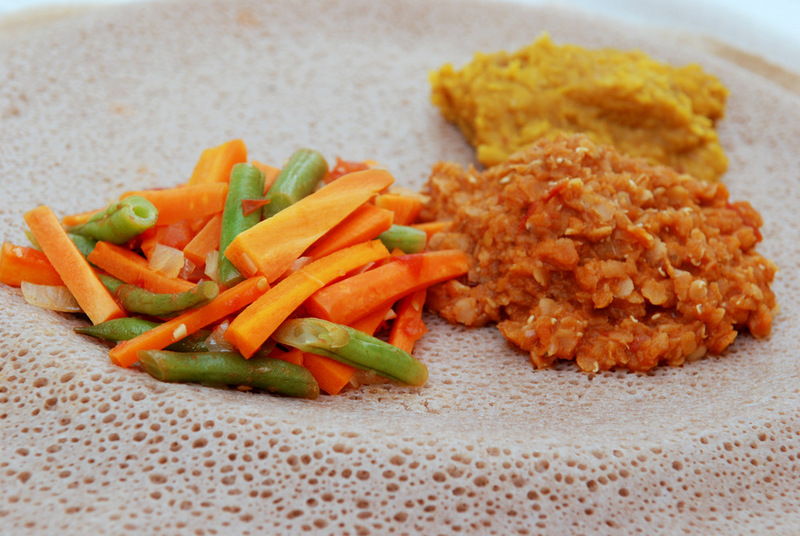 With this trio of recipes from this week (Ethiopian Split Pea Puree (Kik Alicha) & Fasoulia (Ethiopian Carrots and Green Beans Simmered in a Tomato Sauce)) along with the Ethiopian Split Pea and Kabocha Squash Stew with Collards, you are able to put together a veritable Ethiopian feast. Enjoy! In my kitchen, I know exactly what goes into my food. I can control the amount of oil and veggies. I know that I can make a luscious Ethiopian split pea puree without gobs of oil, but do people at restaurants know that? At M&B Yummy, the food doesn’t taste oily but when I first investigated Ethiopian cuisine, I was aghast at the amount of oil used. Vegetables simmered in olive oil is a traditional side dish across the Mediterranean and Middle East. I had my share while travelling in Turkey (and recreated it with beans when I returned) and it is a vegan-friendly option at Greek restaurants. I guess it was no surprise that I really enjoyed the simple carrots and green beans at M&B Yummy as well, where they called it fasoulia. I searched for something similar, and while some recipes drip in oil, I thought it would be better to keep things light and fresh. Skip all that excess oil. Skip the long simmer that turns the veggies to mush. Keep the fresh tomatoes and lemon juice. After these small fixes, the recipe from Olive Trees and Honey was a keeper. I know it looks so simple but it tastes much more than the sum of its components. I call this Ethiopian because that’s where I first ate the combination of green beans and carrots. The original recipe is just for green beans (fasoulia is the Arabic word for green bean). It is a welcome addition to a large plate of Ethiopian dishes but equally suited to other Mediterranean meals. This is my submission to this month’s My Kitchen, My World for Ethiopia and to Cookbooks Sundays. Not only can I get in trouble at grocery stores, I can also get in trouble at garden centres. It makes sense, because it is like a grocery store with such promise for the future. Originally, we had planned to keep things relatively simple. We tried out a few plants last year, and knew that our best results were with our herbs in planters. We were also able to harvest beans (snow peas, snap peas and flat beans), lettuce, Swiss chard and kale, although at much lower yields. Carrots – nada! Kohlrabi – nope. Beets- only the chioggia beets grew and they were way too small.. Zucchini- to be fair, we grew it in a very shady part of the garden and it died. Our rhubarb died a horrible death, too. Our new home has a much smaller garden, but receives a lot more light. I am hopeful we will be able to grow some tasty delights this year. To keep things simple, the herbs would be a definite go, especially since I overwintered them in my kitchen and only had a few casualties (basil, thyme and even the Vietnamese coriander, boo, the last two both perennials). I was going to try my hand at kale again, both with the transplanted kale and with seedlings. After Rob’s mom’s success with dinosaur kale (lacinato kale) from a seedling (and plenty of sun), I was adamant I wanted to try kale from seedlings. I know kale grows easily from seeds, but I figured this could help get the plant bigger and me eating it sooner! Locating kale seedlings is easier said than done. Not only did I not want the standard kale, I wanted heirloom kale. Home Depot? No. Canadian Tire? No. A local independent grocer had the normal curly kale, though. I decided to check in with the closest garden centre: Caledonia Garden Centre. Turns out they had just picked up some kale to sell. Lacinato kale and the normal curly kale. Perfect! When I got home, I had to investigate how to grow collards and kabocha squash! Where would they fit in my garden? Thankfully squash can be grown in containers, so that’s where I put my squash. I am not sure where the 20 foot vines will go but if they make it that far, I will deal with it then! The collards and kale have all been interspersed in the front garden, amongst the perennial flowers. I am hoping they become balmy ornamental greens throughout the summer. Hopefully the sun cooperates and we can feed them properly. Cross your fingers for a summer of green overload! This is my submission to this month‘s Simple and in Season, to Ricki’s Weekend Wellness and to Cookbooks Sundays. There’s Indian food and then there’s Indian food. If you know what I mean. 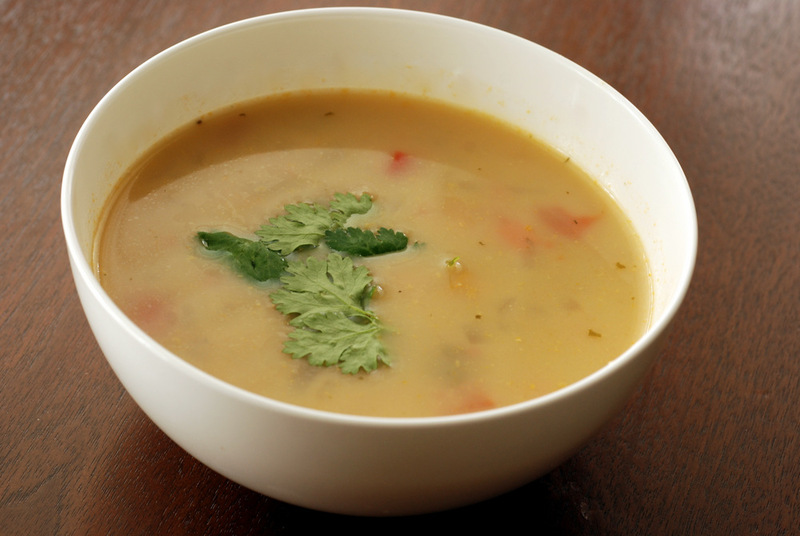 Would my Mom, the coconut-hater, taste the coconut in the Mulligatawny? Would my Mom, the cauliflower-hater, resist the cauliflower in the pakoras? Do we have any closet cilantro-haters? Would anyone shun the tofu in the chocolate-tofu mousse pie? 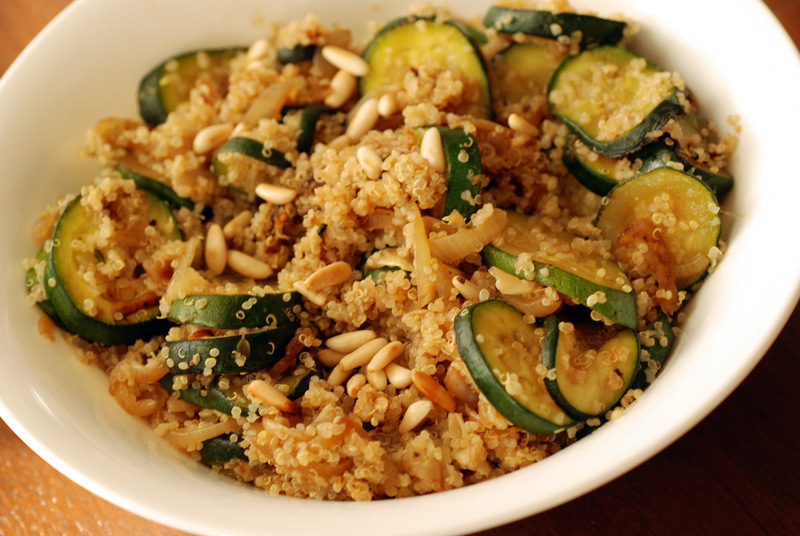 Just in case, though, I decided to break out one of my family’s favourite potluck dishes: a curried couscous pilaf salad. A salad I knew they would like. Throughout its reign at barbecues and potlucks, the recipe has been requested numerous times but it was put on the backburner for a while. 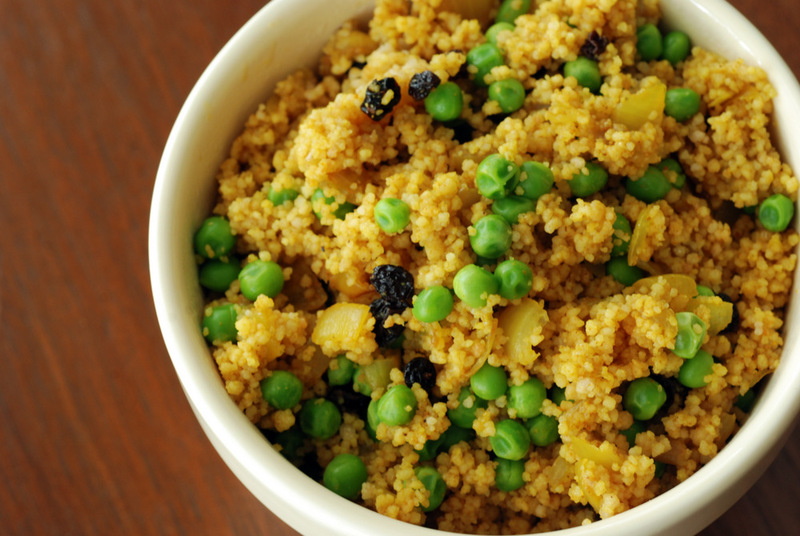 Quinoa is the new potluck food, shunning couscous. A bit of googling taught me the recipe was originally from Canadian Living back from July 1994! With some whole wheat couscous still lurking in my pantry, I decided to break it out for the gang. I put my own twist on the recipe, but only made minor changes (currants for raisins, toasting the spices, etc). 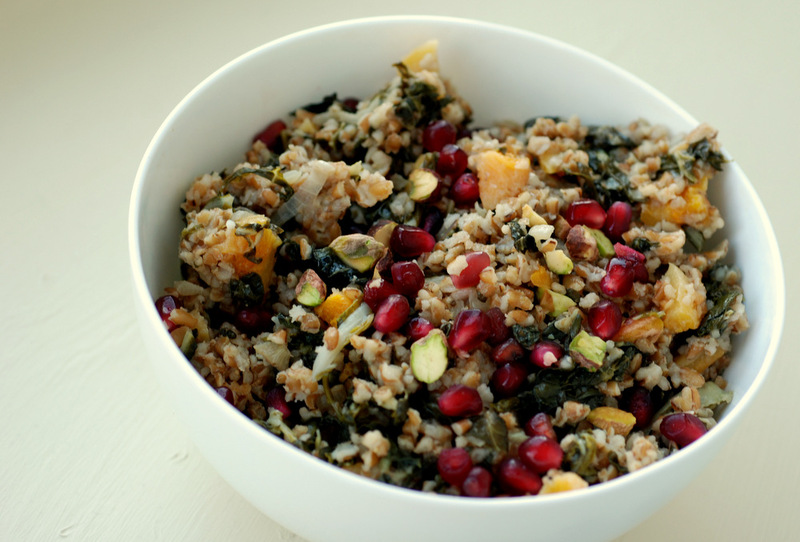 You could easily substitute quinoa or millet for this salad, as well. This is a quick salad to put together, but you still get the benefits from assembling each part separately. First, toast your couscous/quinoa/millet and cook it with stock to up its flavour. Next, saute some onions and add some zip from the toasted curry powder, cumin and a hint of cinnamon. 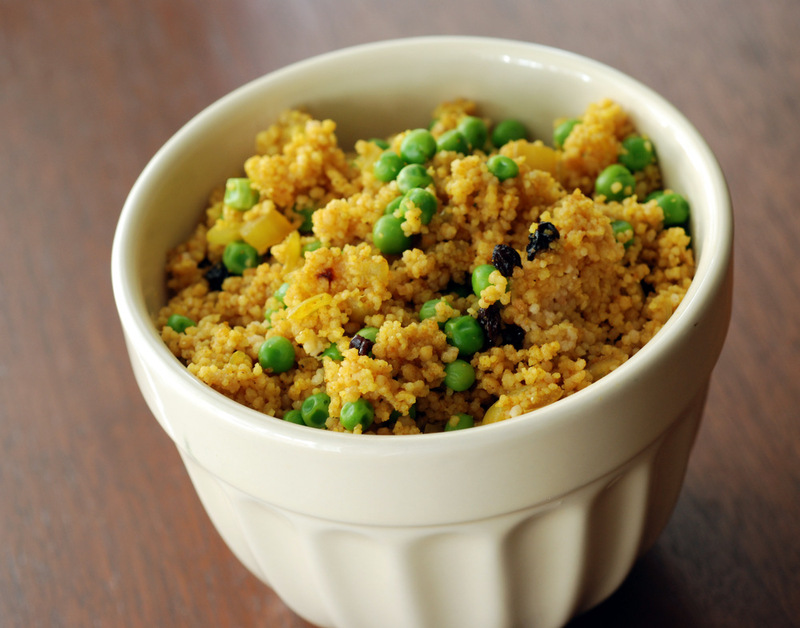 Peas make this a filling salad and currants add a touch of sweetness to balance out the dish. I can see why this is such a knock-out salad at potlucks! This is my submission to Ivonne at Cream Puffs in Venice for Magazine Mondays, to Ricki’s Weekend Wellness to this week’s Presto Pasta Nights, hosted by Alisha and to Deb for this week’s Souper Sundays. Let me get this off my chest: I really liked this meal. It was quick, healthy and tasty. The main component to the tacos is a seemingly simple black bean saute with oyster mushrooms and red pepper. I don’t know what it is, but the oyster mushrooms were fabulous here. They kept their shape, they had a sweet but subtle mushroom flavour but it complemented the red peppers and beans especially well. The Ancho chile-based chili powder made this spicy enough with great flavour. Don’t stop there, just yet. 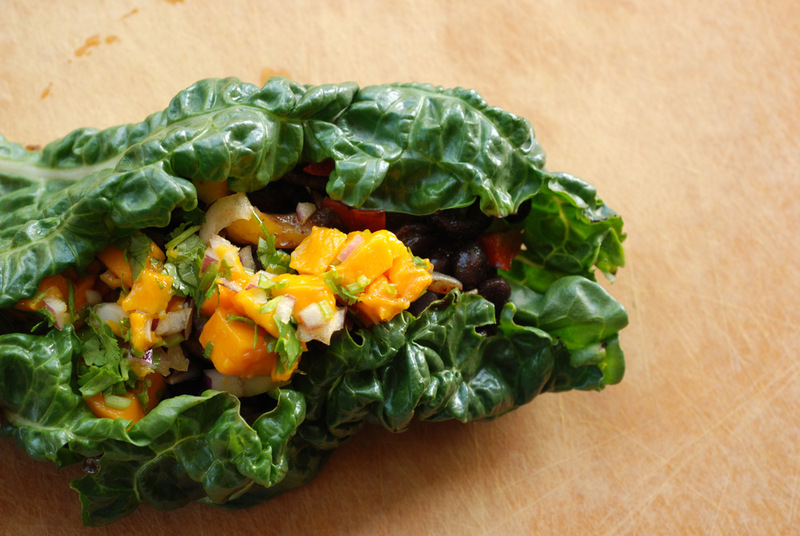 Cut up a sweet mango, toss with some cilantro and red onion and you have a quick salsa that pairs so nicely. Since I used Alphonso mangoes, there was no need to add more sweetener, but adjust to your tastes and available fruits. Now wrap it all up. With a nod to my raw tacos, I decided to serve this in a Swiss chard leaf. Pick your poison: leafy green, flour tortilla or hard taco shell. With each bite, you will have sweet, spicy, and savoury. Juicy mushrooms and black beans. Simple sweet mango salsa – how could it not be good? Thankfully, it is easier to make then our New Best Salad Ever (aka Roasted Garlic Tofu Salad with Cilantro Rice, Black Beans and a Mango Salsa). This was best eaten fresh, with the warmed beans and saucy mushrooms contrasting the cool salsa. For some reason, I tend to gravitate to black beans when I cook Mexican. Probably because I really like black beans. I am working through my heirloom bean stash, though. However, my collection of beans are predominantly Southwestern or pinto bean hybrids (Rio Zape, Bolita, Anasazi, Rattlesnake, Appaloosa, etc). Not sure what to make with them. 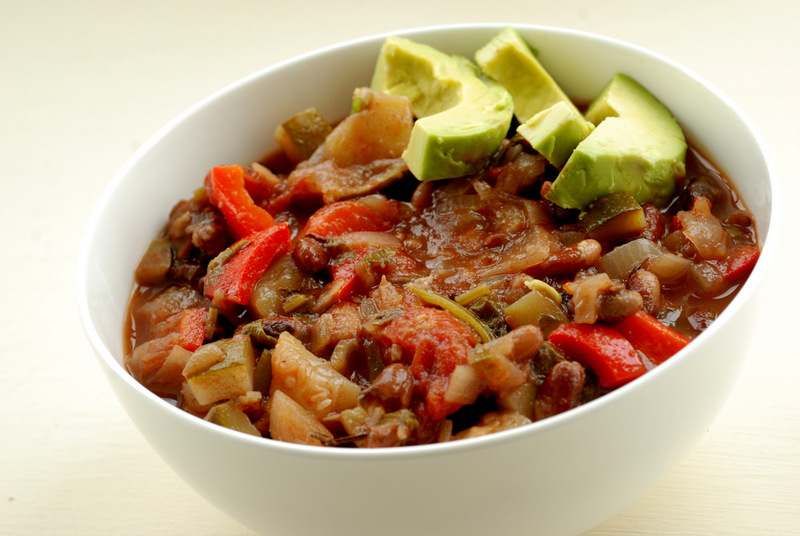 What are your favourite recipes for pinto beans? This is my submission to this month’s Sweet Heat Challenge, featuring Mexican foods and to Ricki’s Weekend Wellness. Can you guess where these flowers came from? If you know anything about me, my garden would be filled with vegetables. Only things I could eat. Hint: I can eat these flowers. And the plant. Hint 2: I never knew this plant even had flowers. Yes, the flowers are from my kale! 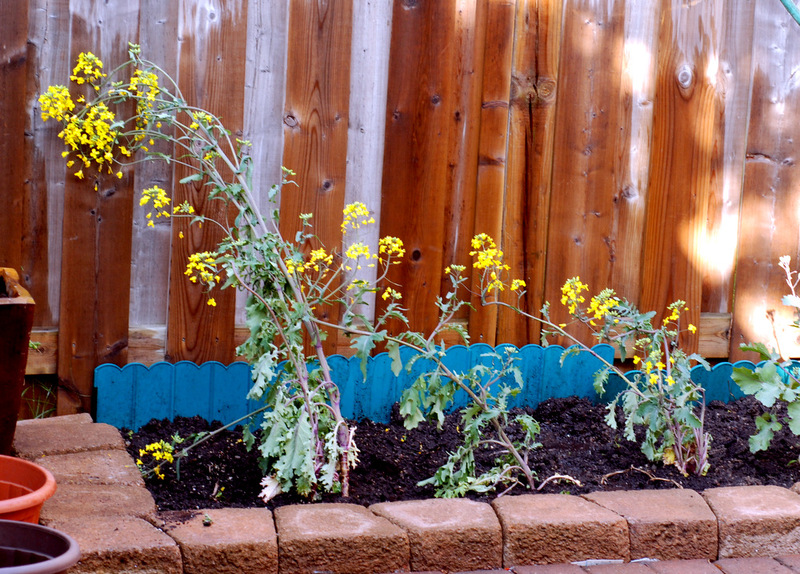 Those are my sad-looking kale plants that Rob and I transplanted this weekend (they perked up by this morning, though). They no longer had a home, so instead of being a legacy gift, we transplanted them to our new home. The funny thing was that when we moved two weeks ago, the plants were maybe 2 feet tall, and now look at them! Huge! With flowers! I was actually kind of worried because once most plants flower, they are finito. That terrible bolting stage. Not so with kale. It is a super plant, for sure. Apparently, the leaves are still just as tender and tasty (albeit maybe smaller), and the flowers are edible, too. 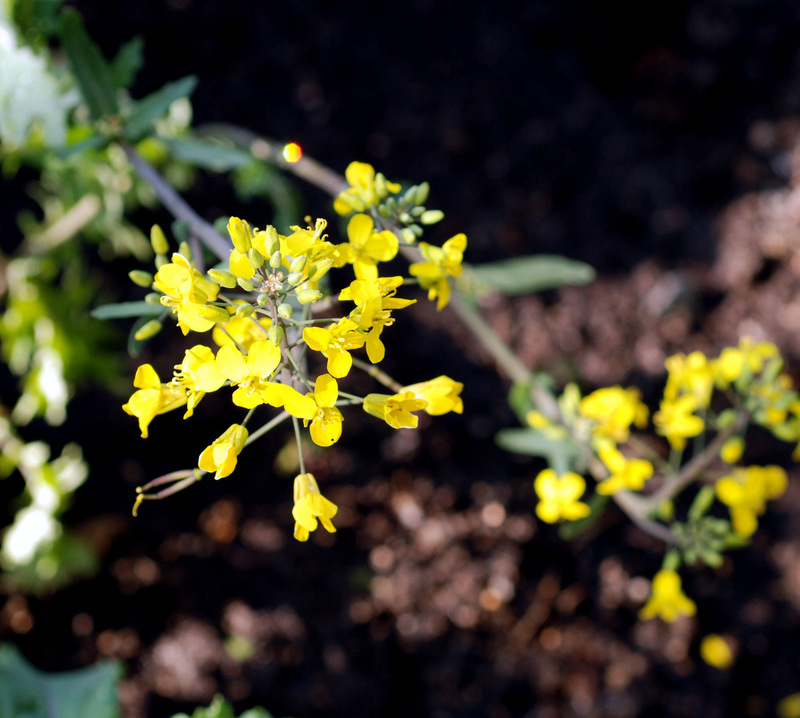 You can use the unopened flowering portion just like sprouting broccoli. Turns out that kale is a plant that lives 2 years and in its second year, it produces these beautiful flowers. As you can see the leaves look a little sad, so I am leaving them on the plant until it has revived slightly. 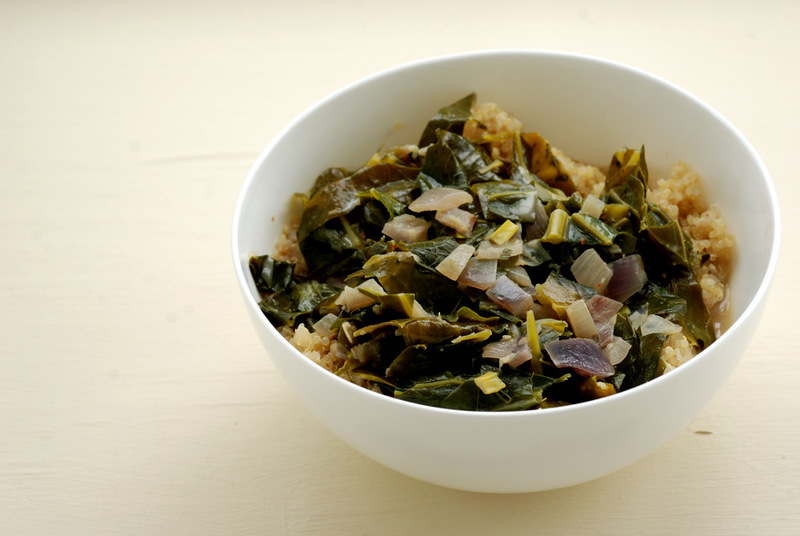 Instead, I will share a recipe for spicy coconut braised greens. 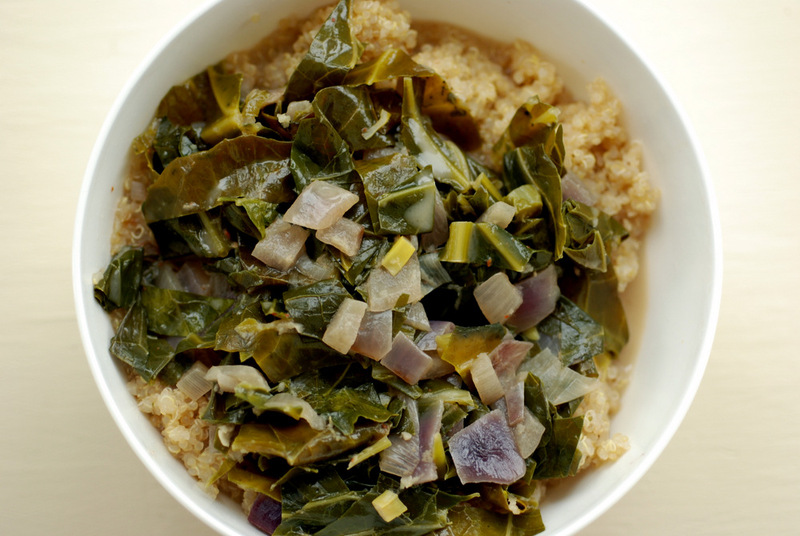 You can use kale, too, or collards, like I did. 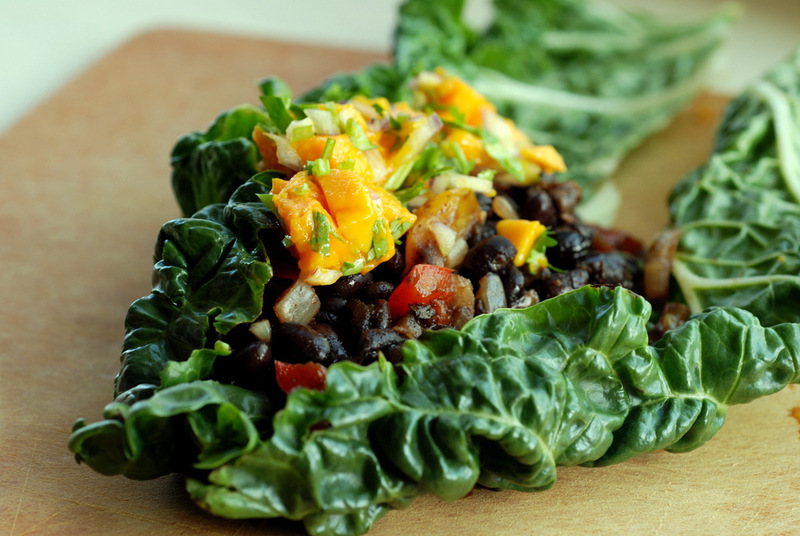 Whenever I post a recipe for raw collard wraps, I invariably receive a comment from a perplexed reader wondering whether raw collard greens are too tough to eat. Personally, I think collard leaves are one of my favourite greens for raw wraps since they are more sturdy than kale, Swiss chard or lettuce, and I do not find them to be too chewy. Firm and sturdy, yes, but that is why they are the base of the wrap. However, I know not everyone enjoys greens as much as me (like Rob), and may be more likely to add collard greens to stir fries or soups instead. When I cooked my chickpea-collard roulade, though, I was aghast at how creamy collard greens could become. Thus, my curiosity was piqued when I saw Cara’s recipe for Spicy Coconut Braised Kale, where the greens are simmered in coconut milk for half an hour. While I have seen greens simmered in coconut before, I was intrigued when Cara used the coconut milk from refrigerated cartons, instead of the canned coconut milk. Not really a fan of making veggie sides, I employed my latest trick of tossing saucy veggies with quinoa for a complete meal. 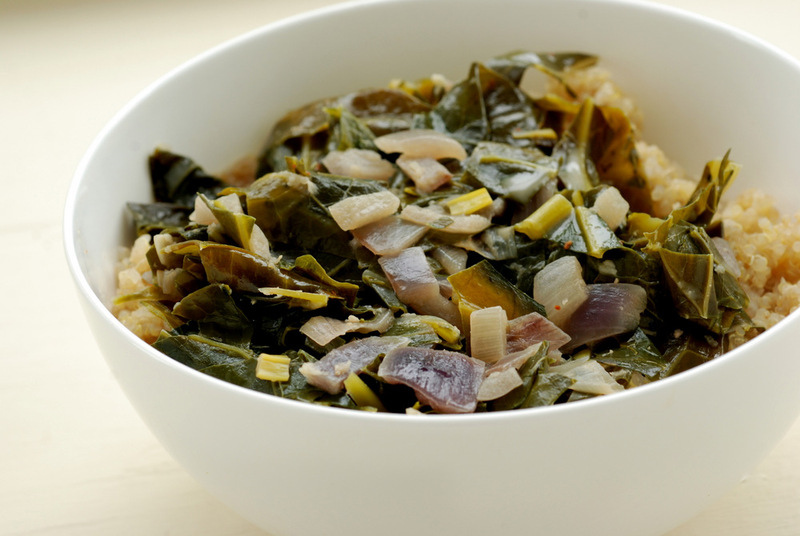 After the long braise in a warmly spiced coconut broth, the collards become nice and tender. I liked that it was a rather light dish with a nice coconut flavour, courtesy of the coconut milk beverage. There was so much braising liquid left over, I almost wished I had used another bunch of collards. In any case, the quinoa was a perfect vehicle to sop up all of the juice. Next time, I may add in some squash and chickpeas, or decrease the amount of coconut milk. This is my submission to this week’s Weekend Herb Blogging hosted by Fragoliva and to Ricki’s Weekend Wellness. It may be a good thing that Sunny and I live further apart. I won’t get into as much trouble with my grocery shopping. You see, we needed to get more chickpea flour and tamarind. No better excuse to head out to Sunny’s one last time. I scope out my weekly meals based on the produce that is on sale. I knew oyster mushrooms were on sale, so I planned to make mushroom dal. Green beans were also on sale, so I had planned a meal for that, too. I still meander through the produce section to see what else is available, though.. and that’s when I get into trouble. Unadvertised specials: Two bunches of broccoli for $1. Huge collards for 79c/bunch. Hard-to-find green mangoes were spotted. So. Hard. To. Resist. I am weak against fresh, cheap veggies. I succumbed. I contained myself, though, when I saw a huge amount of mixed baby greens on sale for $3 (it must have been a bag of 20 lbs, I kid you not), though. My weekend menu gets turned upside down. Now I am not entirely sure what I want to make. 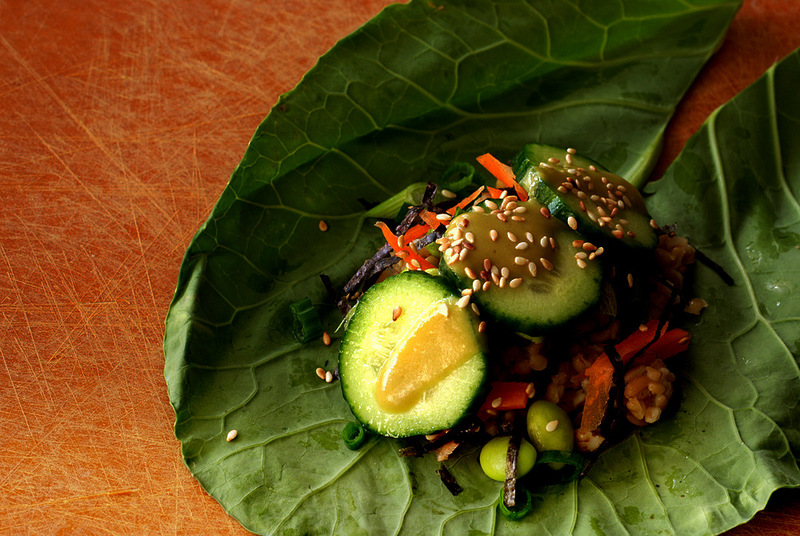 In the end, I made the sushi roll edamame collard wraps earlier in the week with the collard greens. By the end of the week, I wanted to try something cooked instead. 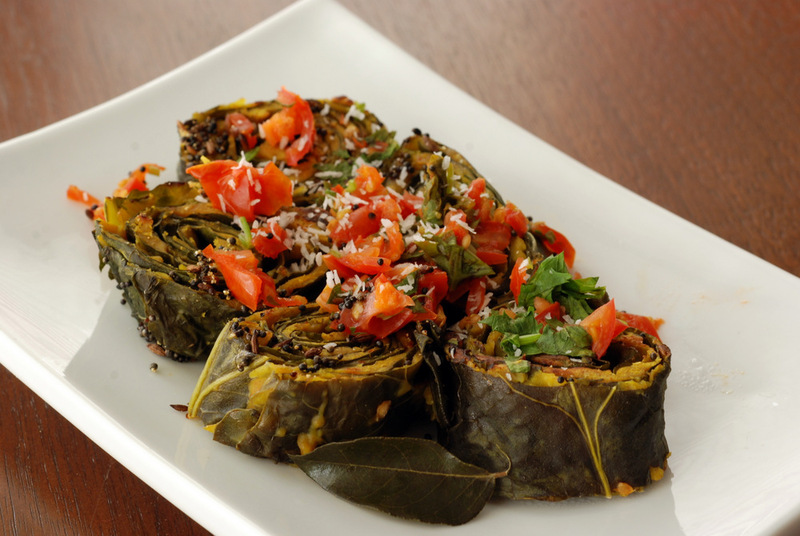 Continuing on my current Indian kick, I turned to 660 Curries and I was shocked to find a recipe using collards: Roulade of Collard Leaves with a Tomato-Mustard Sauce! 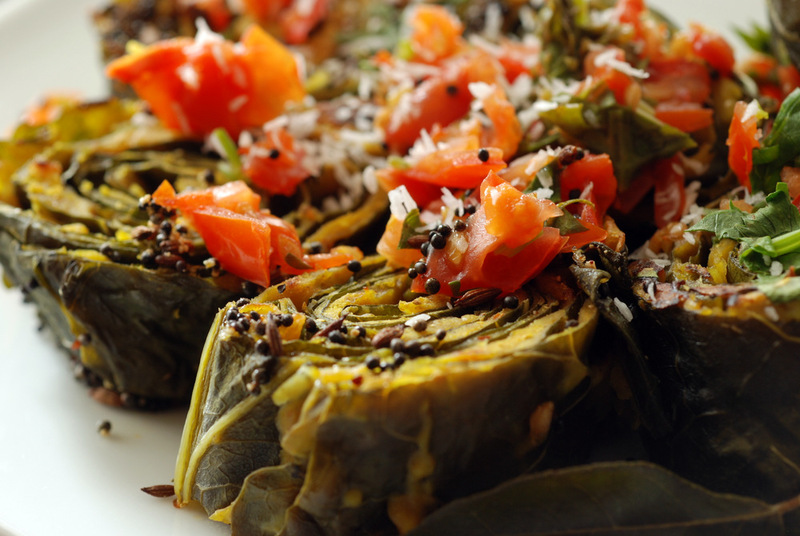 Collard leaves are used to envelope a savoury chickpea flour batter, drizzled with a tomato-mustard sauce. 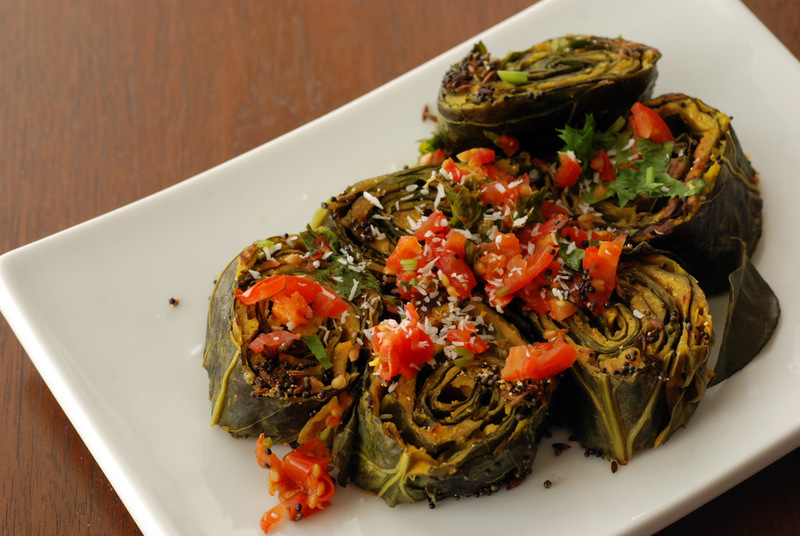 The authentic Indian version uses taro leaves but Iyer insists that collards are a nice, if somewhat chewier substitute. My curiosity was piqued instantly. My Indian repertoire consists mainly of bean-based curries, so it was nice to try something completely different. This is an appetizer, but it is hearty enough to be a main meal if you eat enough. Here, you make a delectably savoury filling based on chickpea flour spiced with coriander, cumin, chile flakes, ginger and tamarind. Please stop to taste the filling, it is very good. Just don’t eat too much of it because it is then thinly spread overtop collard leaves. With around one tablespoon of batter per leaf, I had my doubts whether this would all stick together in the end. You stack 4 collard leaves on top of each other and tightly roll it together and secure it with a toothpick (or string). Next, your collard roll is steamed until tender and the chickpea batter is cooked. After a bit of cooling, you slice them, then pan-fry them until brown with mustard and cumin seeds and then briefly stew them with some tomato and cilantro to create a quasi-sauce. Dust with some coconut and you have some seriously flavourful collard bites. The collards are meltingly tender, the chickpea filling so tasty and the nibbles are eerily creamy. The extra flavour from the tempered spices make this sing. My tomato-mustard sauce never really delivered, as I may not have had a big enough tomato, but the little smattering of tomato-cilantro was nice in moderation. I know it seems so complex, but it is fairly simple to make. I’d bust this out for my next Indian fest, though, as it is best when fresh and very impressive, while still pretty easy to make. Iyer says these can be prepared in advance and frozen, which would be a delicious treat to have stored for a rainy day. This is my submission to this week’s Weekend Herb Blogging, hosted by Cinzia. If you had to pick one, which would it be: garlic or chocolate. Which one could you give up? Which one would you keep? I know, tough choices. So different. Apples versus oranges (although I would pick apples). If I wasn’t biking this weekend, what was I doing? I was in Woodstock for Rob’s sister’s bachelorette and bridal shower. Her gonna-be-groom does not eat beets nor cabbage (Rob’s loving Polish family has still accepted him). And in this predicament, garlic versus chocolate, he would pick to keep garlic, hands down. Well, Rob and I took advantage of the barbecue and barbecue weather to grill up my favourite grilled portobello mushrooms which are marinated with balsamic vinegar, oregano, thyme and yes, garlic. Delicious grilled garlic. 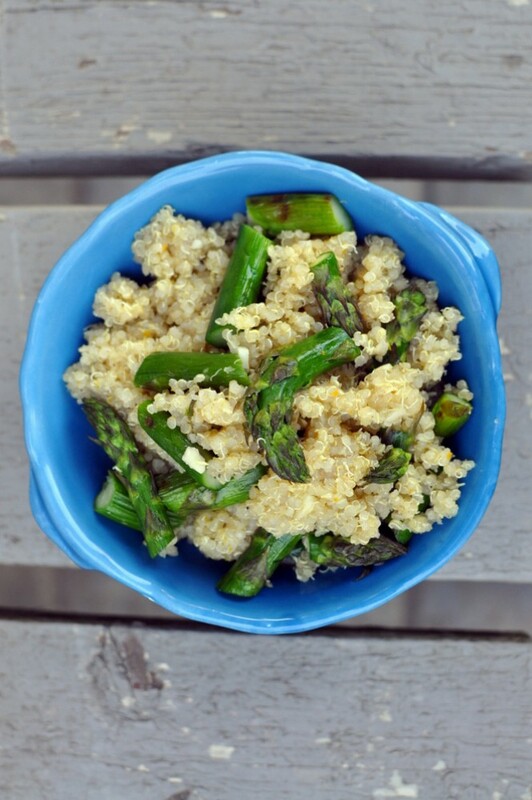 However, I also went for a garlic double whammy with this Lemon Asparagus Quinoa Toss. 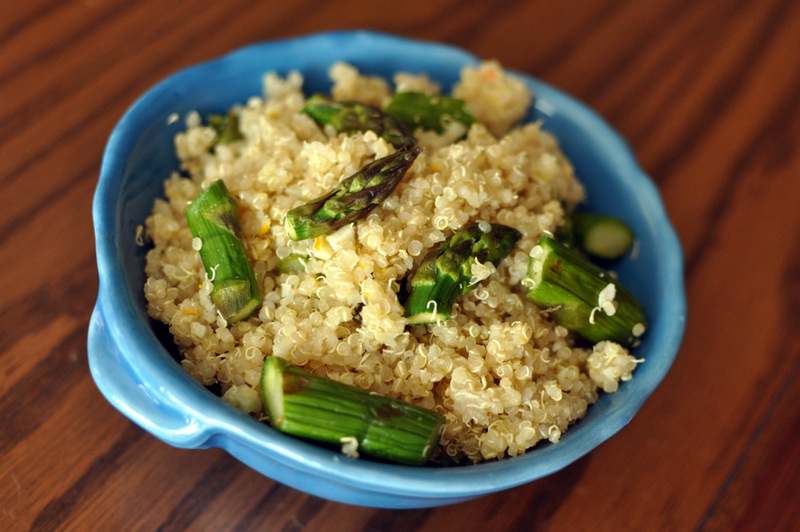 I should rename it Grilled Asparagus Lemon-Garlic Quinoa Toss, because as most of Tess‘ great recipes, this one features raw garlic. I made this recipe last year when I had local asparagus. Now that Ontario asparagus is just starting to arrive, I broke it out again. I changed her recipe, a tad, this time, by roasting the asparagus on the barbecue, as well as decreasing the raw garlic (gasp!) and oil, but increasing the fresh lemon juice and adding lemon pepper. Meyer lemons subdue the lemon flavour, so for a nice match for the bold garlic, consider using the regular lemons. While Rob and I didn’t go biking, we did a short 10-km walk/hike around the periphery of Woodstock instead. In true backpacker style, I wore my hiking gear (hiking boots, jacket and my new (and first) sports bra– it needs to get broken in, too!) and loaded my new (and first) backpack with 15lbs of stuff. So far the verdict has been all positive! Sadly, our cheapo trip to Colombia will be more expensive with all the stuff we’re buying in its preparation- why are sleeping bag liners so expensive? Look at this uber cute and practical collapsible bowl set I bought, though. I tested them out, too, this weekend and no leaky oatmeal! This is my submission to Deb for this week’s Souper Sundays, to this week’s Healthy Vegan Friday, to this week’s Weekend Wellness, to this month‘s Simple and in Season, and to Cookbooks Sundays. I can’t believe that a year ago this weekend, I was already biking to-from Toronto and Kitchener (120 km, one-way). While I am planning to cycle to/from Toronto and Niagara Falls in June (160 km, one-way), our fall-back is a shorter course that leaves from Burlington (90 km). With so many things happening this spring (moving, Colombia, hiking training, etc), it has been hard to dedicate as much time to long-distance cycling. Funnily enough, I have still clocked more kilometers on my bike due to my long daily commutes (780 km already clocked this year). However, nothing beats the long rides on my road bike as true training. Two weekends ago, Rob and I did a short jaunt in the cold for 35 km. True, I cycle that much on a typical day but it is spaced out. But that was enough for me. By the end, my back was sore for some odd reason. One really needs to ease into these long distance trips. I know I’ve been posting a few recipes highlighting high protein options for typical carb-heavy meals, but my main focus for protein-friendly meals will always be a combination of beans and veggies. Brendan Brazier has always recommended a 3:1 to 4:1 carb-to-protein ratio, preferably a liquid for easiest digestion after recovery from sports. 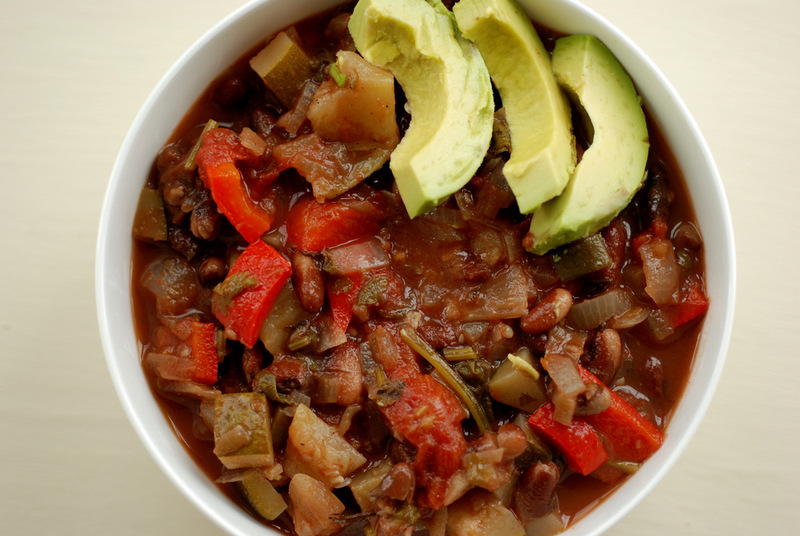 This is easy to get from bean- and veggie-centric soups and stews. While I didn’t encounter anything like this in Turkey, the recipe for this Turkish red pepper, chickpea and cilantro soup came from Classical Turkish Cooking. I bookmarked it while searching for ideas with celeriac. I really liked how fresh and vibrant this soup was without being heavy. The simple soy milk makes this creamy along with the pureed chickpeas. The red pepper confers sweetness, celeriac a hearty celery background and the parsley/cilantro combo complemented it all really well. It has simple flavours that worked so well together: perfect as a light yet filling soup for the spring. The original recipe suggests pureeing the whole soup and then straining it, but I don’t like pureed soups, so I used my immersion blender to puree it partially. I was able to enjoy the benefits of the texture from the veggies as well as the additional heft from the puree. This is my submission to Deb for this week’s Souper Sundays, to this week’s Weekend Wellness, to this month‘s Simple and in Season, to this month’s My Legume Love Affair, hosted by Priya, to this month’s Bookmarked Recipes, to this week’s Sunday Night Soup Night, and to Cookbooks Sundays. The point of making a sushi rice bowl salad is that it is easier than rolling numerous sushi rolls. I know, I’ve done it before. So why would I bastardize a perfectly nice sushi salad by turning it into a wrap? 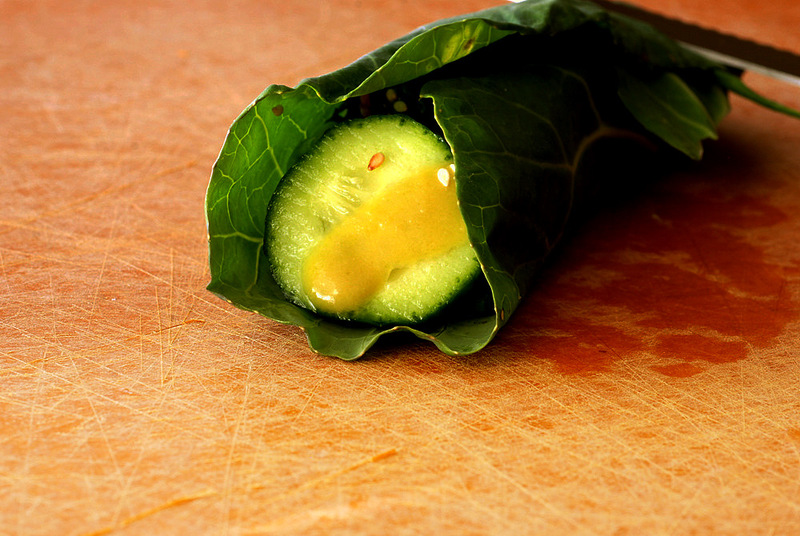 A collard wrap, of all things, instead of a sushi roll. 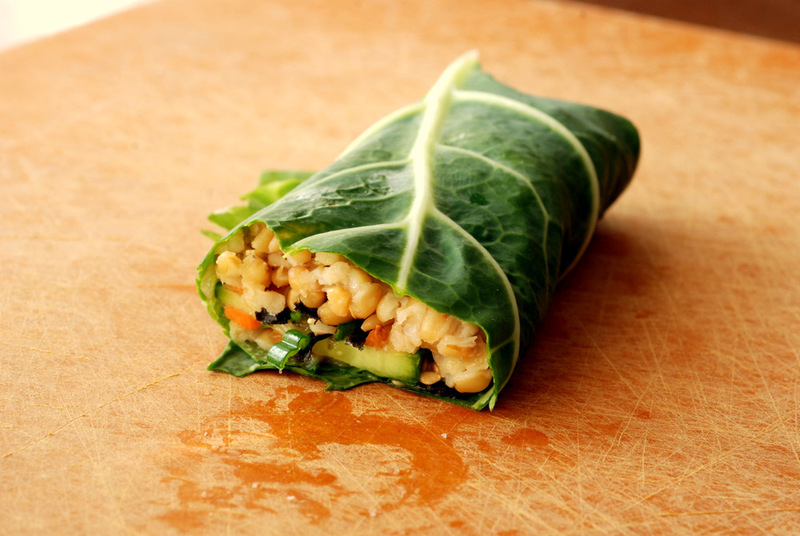 As you probably figured out, I like wraps, especially when wrapped with a green leaf like Swiss chard, kale, collard or even Romaine lettuce. Hearty greens don’t go soggy. My leaves are usually small enough for bite-size snacks, rolling up a few for tasty meal. While I also like salads, I preferred this as a wrap. With a wrap, you make sure every component of the salad hits your palate at the same time. 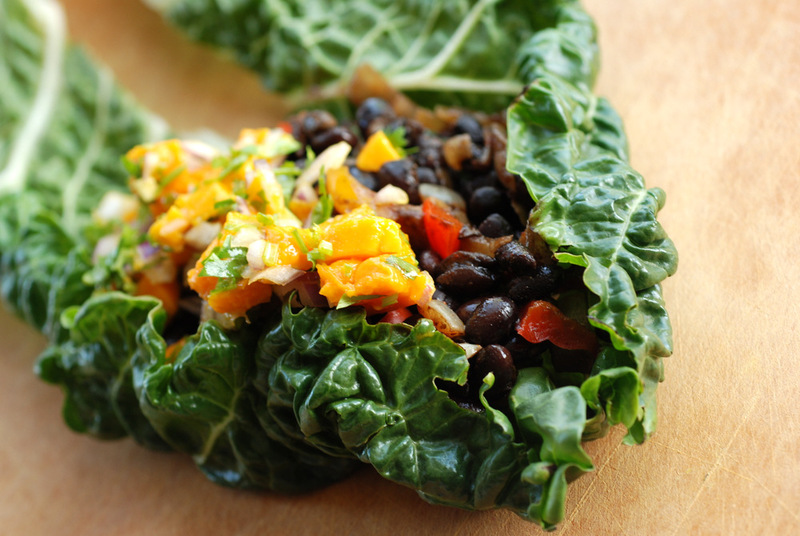 If you are tired of eating delicate leafy green-based salads, consider turning it into a green wrap. Where your greenery is just presented in a different form. This is my submission to this week’s Weekend Herb Blogging, hosted by Rachel and to this week’s Weekend Wellness. Vacations are supposed to be relaxing, right? Not if you are Rob and me. Hearing my cousin’s stories about the lovely beaches, vibrant (shifty?) street-life, fabulous hiking and river cruises in the Amazon, we are excited to check out such a diverse country. One thing Rob and I are planning to do is trek to Ciudad Perdida, Colombia’s Lost City (aka Colombia’s Machu Picchu). It is a stunningly beautiful but grueling 6-day hike through hot and humid conditions. My cousin had tons of stories from his trip – having to stop hiking around noon because it was so hot (over 32C with high humidity) but then swimming all day in the waterfalls, visiting a cocaine farm, stunning vistas, but also being infested by tics, another girl attacked by fire ants and not being able to walk the day following the hike. Hopefully Rob and I are up for the challenge! I think this will be harder than our 2-day 360km bike ride to Kingston last year, but totally worth it. I love this description from Trip Advisor: To enjoy the trek you will need to be relatively fit, not afraid of heights, be sure of foot, not mind cold showers, not mind being dirty, have the ability to fall asleep in a hammock and enjoy mucking in. While we are still working on our trip itinerary, I love taking cooking classes when I travel. I am scheduling a cooking class in Bogota that promises a trip to the market AND all meals to be vegan. Rob is quite concerned about the availability of vegan options outside Bogota, but I am hopeful things will work out. For the hike, the tour group promises meals filled with beans, lentils and brown rice for me. I hear the fruits and potatoes are to die-for, though, so I will not pass up the opportunity to sample those. If I bring quinoa, I can teach them how to cook it for me, too. Legend has it that the Inca army subsisted partially on quinoa, and I see no better way to trek through the Colombian jungles. It is no secret that it is one of my favourite (pseudo)grains. 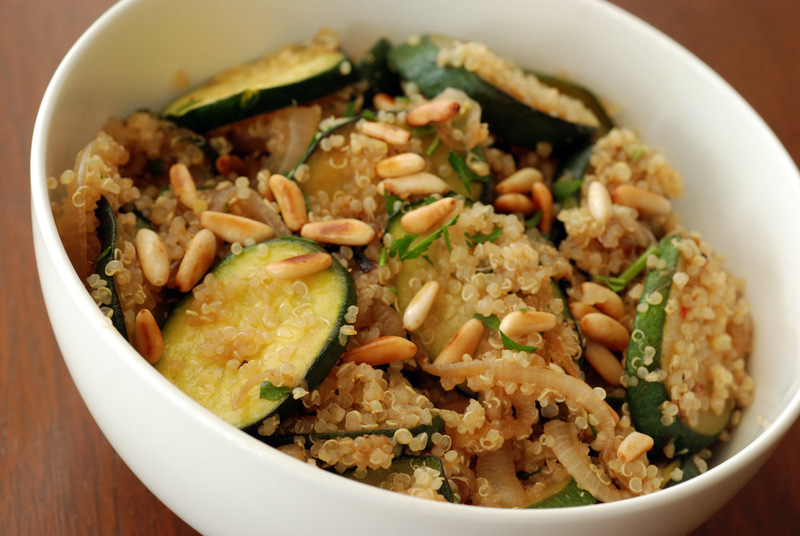 In honour of quinoa, here is a simple yet delicious salad. I honestly wasn’t expecting much from such a humble set of ingredients, but they worked so well together. Zucchini and thinly sliced onions are slowly pan-fried with thyme to create a lovely caramelized duo. 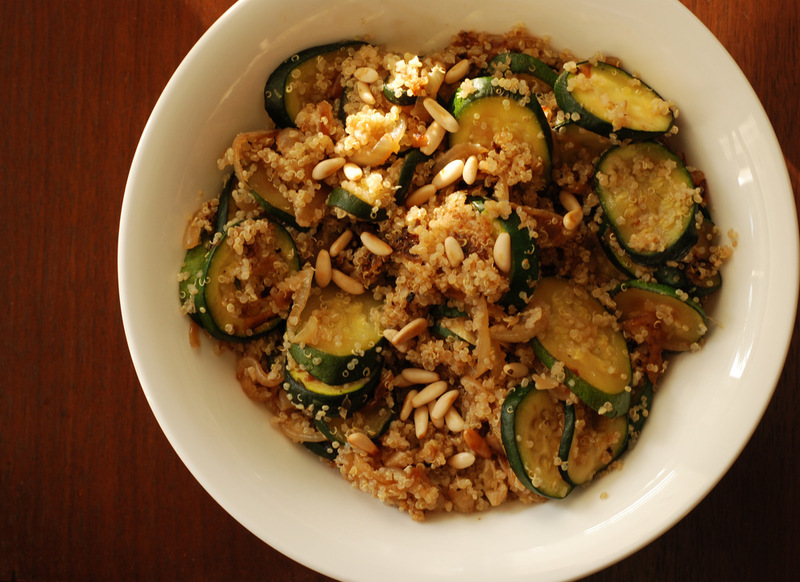 The zucchini impedes full caramelization of the onions, but it is a much simpler way to create the salad. The purists may want to caramelize the onions solo for 45 minutes and roast the zucchini on a grill for even more flavour! Regardless, my way is great, too. The veggies are then tossed with the quinoa, lemon and parsley. I don’t use parsley much, but its slight (but not overpowering) flavour was quite refreshing here. 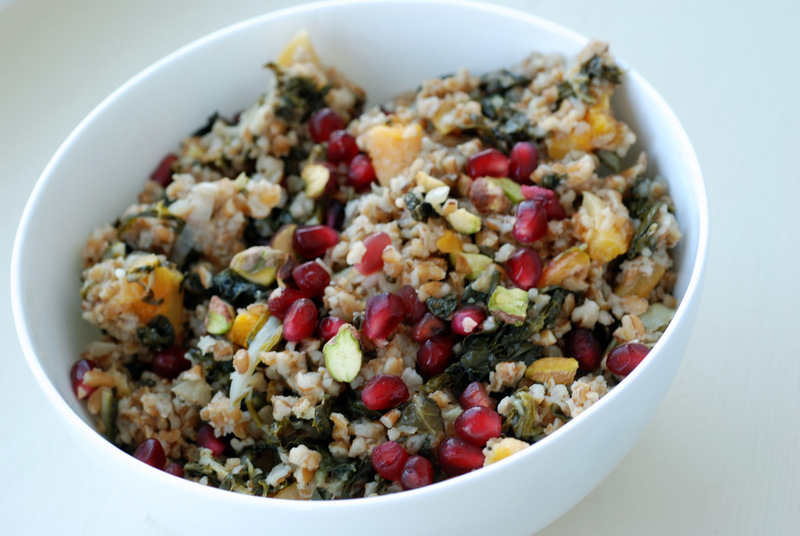 Top with some toasted pine nuts, and you have a filling dish. I could definitely eat this every day while hiking. Any favourite travel snacks that can withstand high temperatures? This is my submission to Deb for this week’s Souper Sundays, to this week’s Weekend Wellness, to this month’s River Cottage Rocks Veggie Heaven and to Cookbooks Sundays.